It's March 2nd 2007 and have released the first theme of the month to members. It's called Villadi and if I knew what Villadi meant I'm sure it would all stack up. Like all things JoomlArt if you're already a member you can pop along and download it but if you're not why not join up today? You get access to an existing library of twenty-five themes and over the next twelve months you also get another twenty-four themes as they are releasing two themes a month. 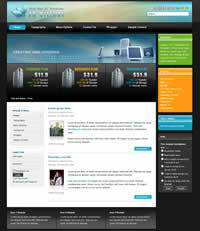 For more information, a demo of the new theme or to join up, visit JoomlArt.